Money can’t buy happiness… but it can buy crawfish and that’s pretty much the same thing! Check out their Wednesday Special- 3 lbs. of crawfish and a choice of 15 wings OR a 100 oz. beer tower for $25. 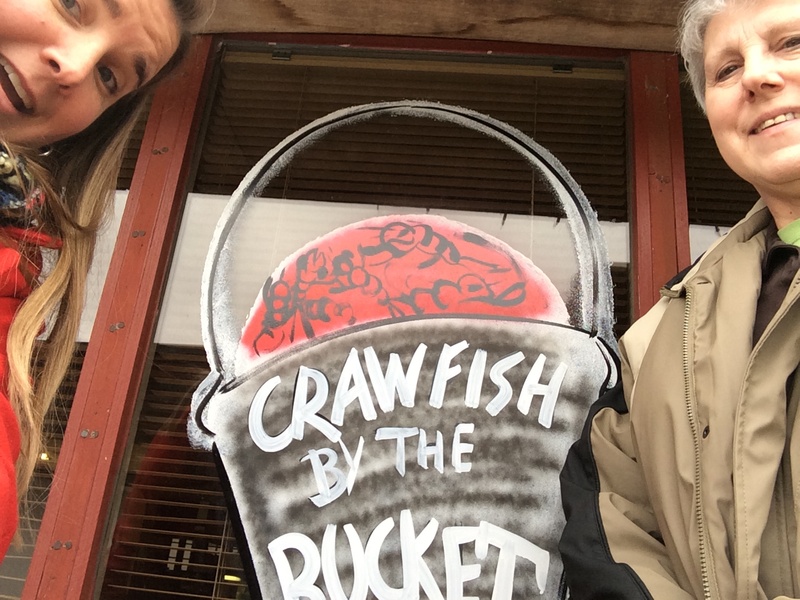 When it comes to crawfish, Monroe-West Monroe restaurants don’t play. 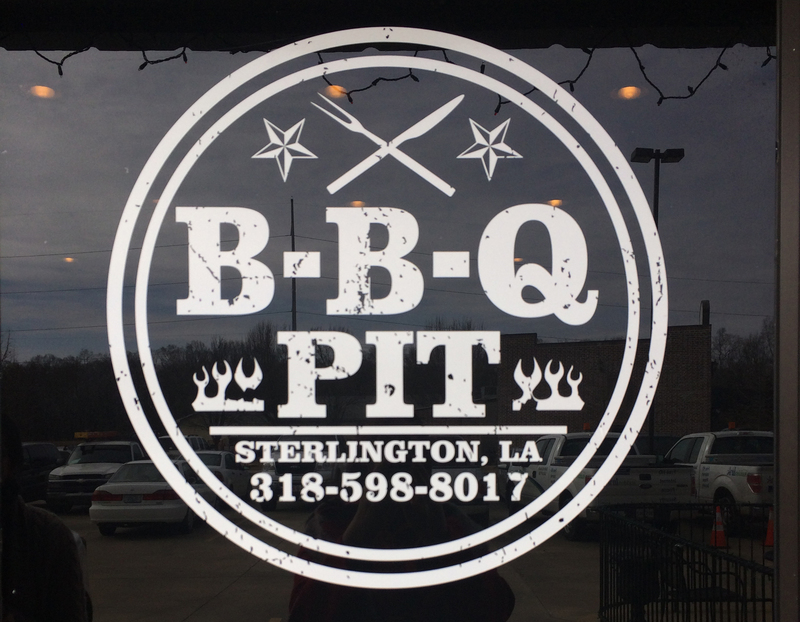 Whether you are want to dine-in or carry-out, live crawfish or boiled, the options are endless, so go out and try them all! By Harolyn F. & Scott B. 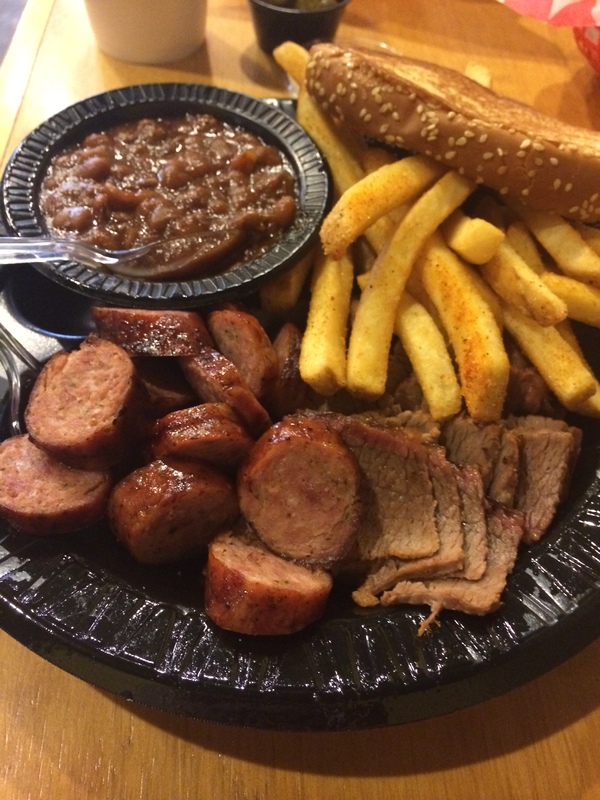 We love our local food, and today was no exception. 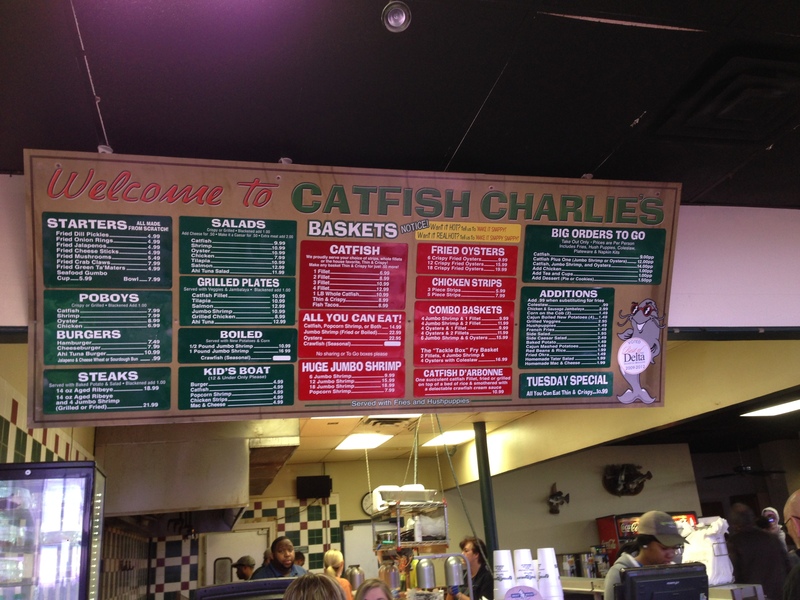 We dined at Catfish Charlie’s which is located in the Office Depot Shopping Center on Louisville Avenue in Monroe. Doug Wood opened the restaurant 7 years ago with the motto “homemade, big and fresh”. Growing up Doug’s grandfather owned Harry’s Seafood and relatives also owned Bend of the River Restaurant so the restaurant has been a family affair for the Woods. Kim Romero who is the General Manager is a delight and if you are not sure what to eat she can give you so many suggestions you end up wanting a little of everything on the menu. 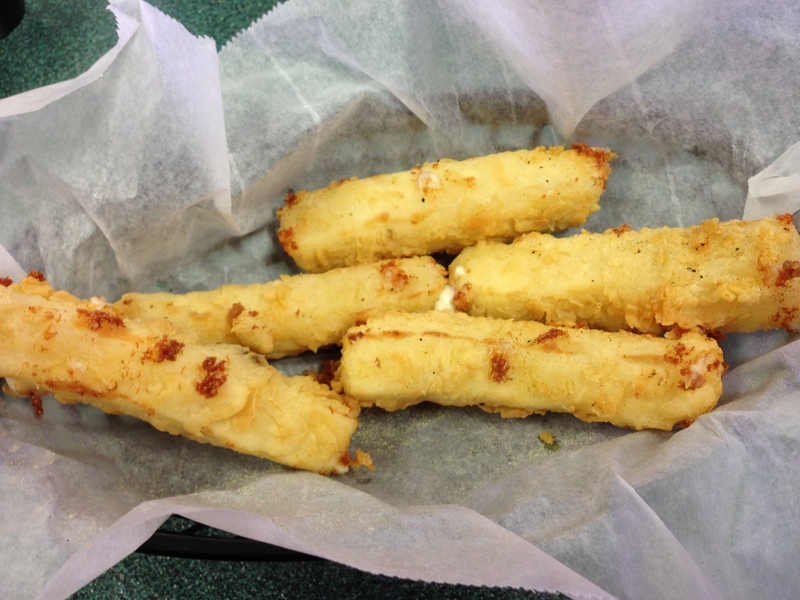 Unique to their restaurant is the thin & crispy fried catfish and hand cut mozzarella cheese sticks battered and fried. 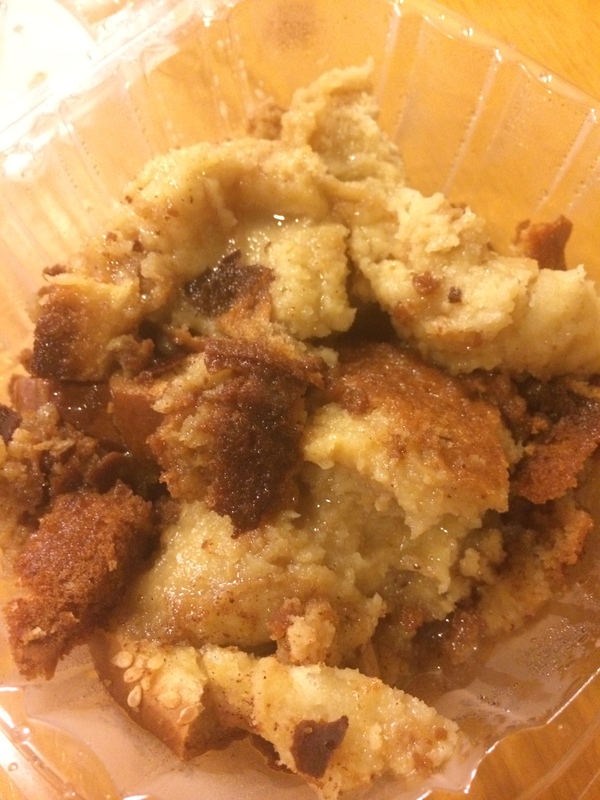 Did we mention the great homemade desserts such as Ooey Gooey Cake. Need we say more? Yum. 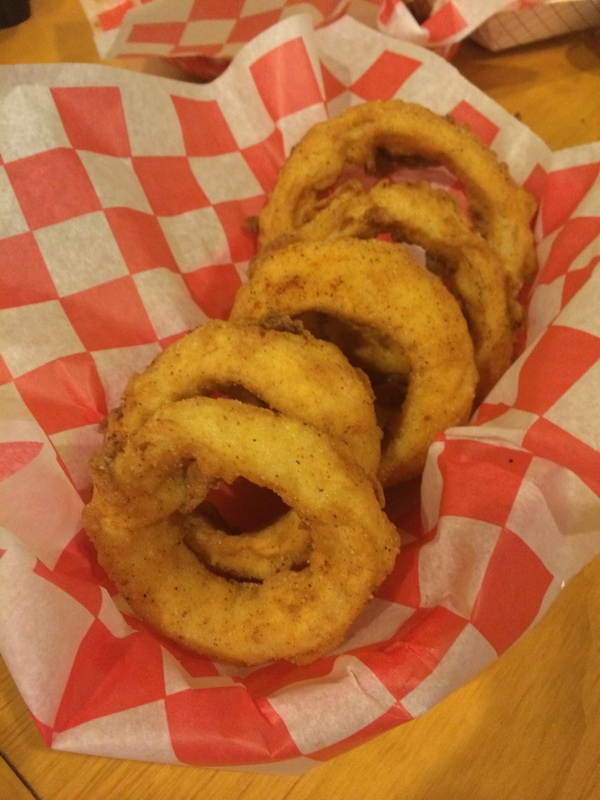 Daily specials include gourmet burgers, all you can eat thin and crispy catfish, 14 oz hand-cut ribeye steak, Catfish D’Arbonne or fish tacos. 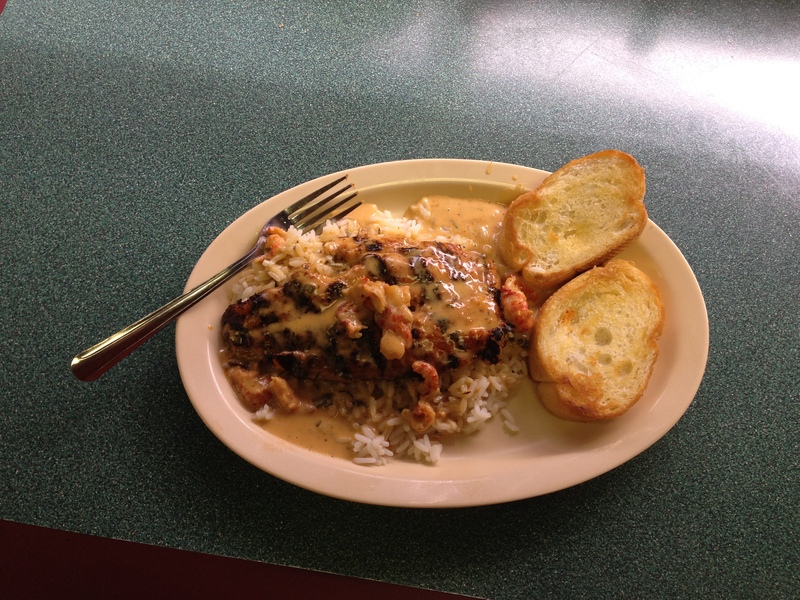 The Catfish D’Arbonne comes with one catfish fillet, fried or grilled, on a bed of rice and smothered with a delectable crawfish cream sauce. 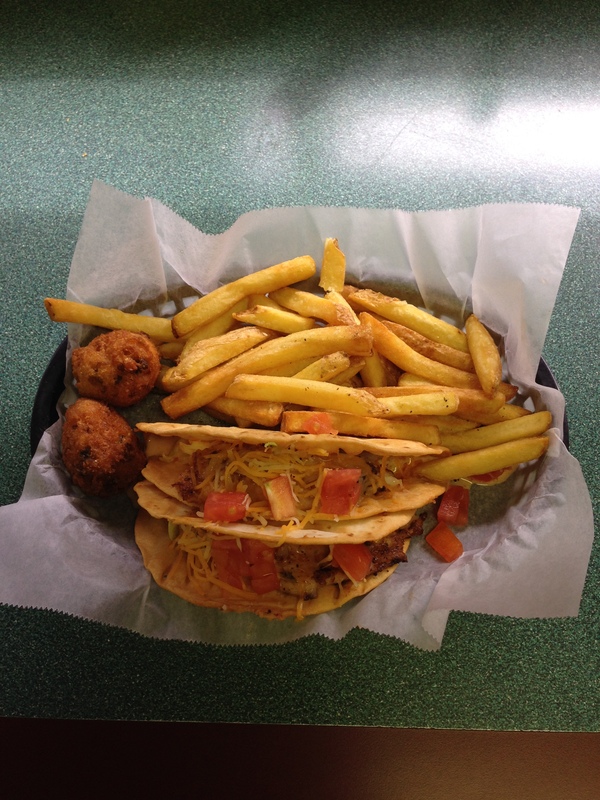 The fish tacos are a fried taco shell filled with grilled catfish and a spicy coleslaw. 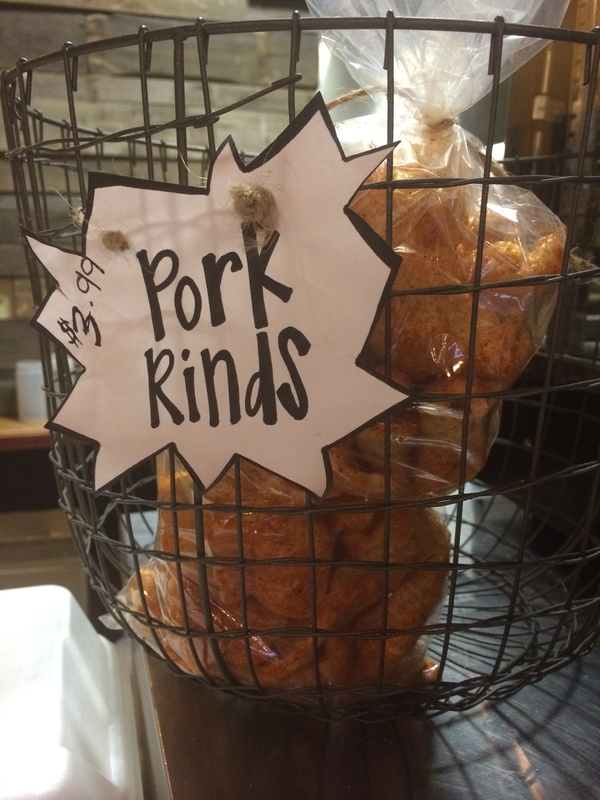 They are served with fries and hushpuppies. If you are looking for healthier options but just as tasty as any other dishes try the grilled Ahi Tuna or Salmon and grilled vegetables. 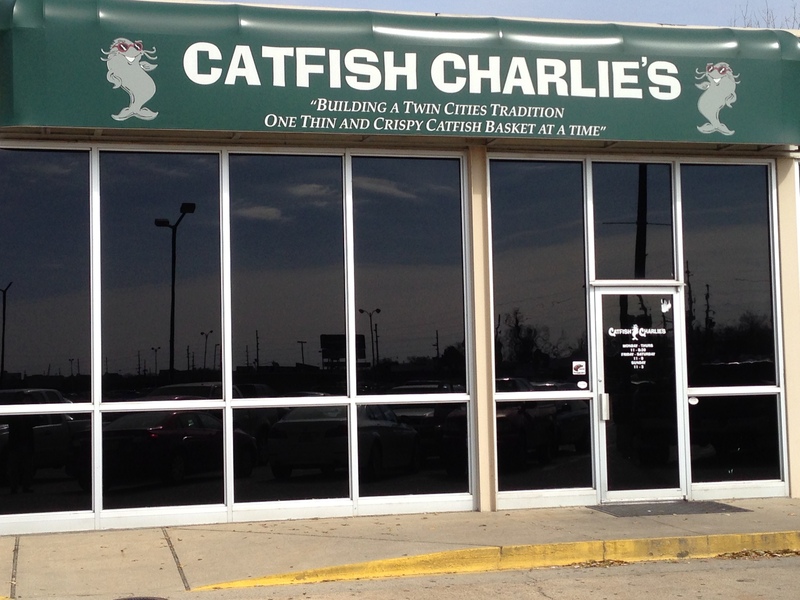 Catfish Charlie’s is a restaurant that is spacious, family friendly, and very affordable with meals prepared fresh and served quickly. The restaurant also has banquet space with accommodations for 100 in large room and 60 in smaller room. They are open for business Monday-Thursday 11am-8:30pm, Friday & Saturday 11am-9pm, and Sunday, 11am-3pm. They offer Dine In, Take Out, or Drive Thru service. by Alana C. & Ruth C.
Ruth and I headed out for late, late lunch to a local favorite, The Cheniere Shack (pronounced Shin-e Shack). We just missed the lunch time specials which seemed tempting on this very cold day. 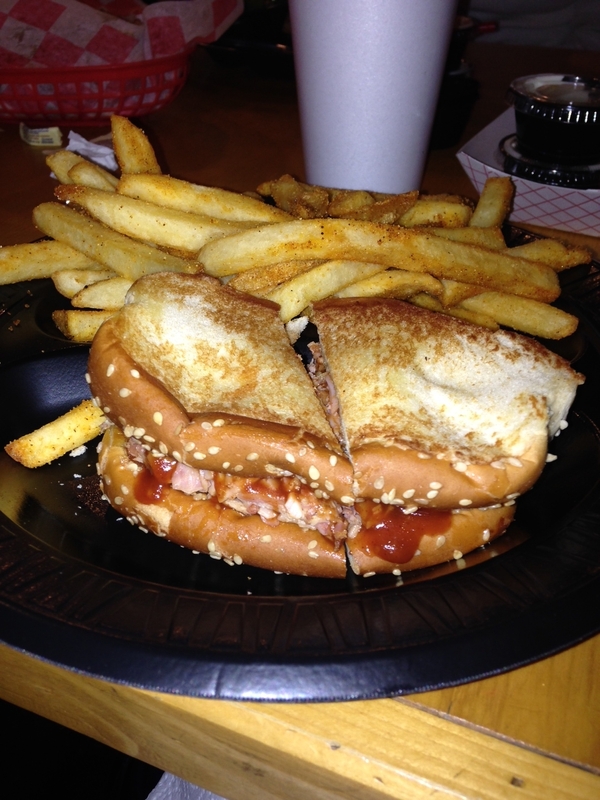 They have 6 choices such as red beans and rice to a patty melt from 11AM – 2 PM for just $6.39. What a deal! They offer hot water cornbread with their red beans and rice. That is truly a southern delicacy you can’t find everywhere. We missed that time frame so we ventured into the full menu. 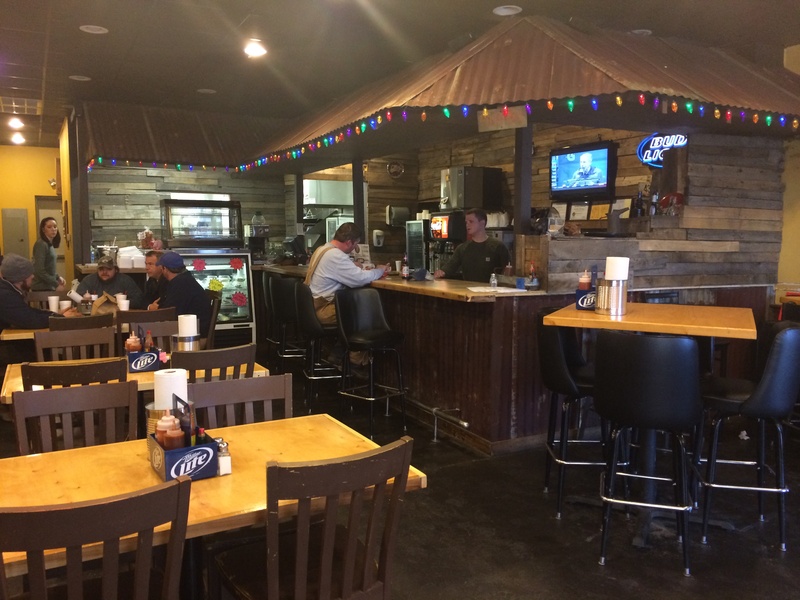 Our waitress Danielle, said boiled crawfish is their most popular item, then fried fish, boiled shrimp, and the po-boys – that is any of those are a hit. 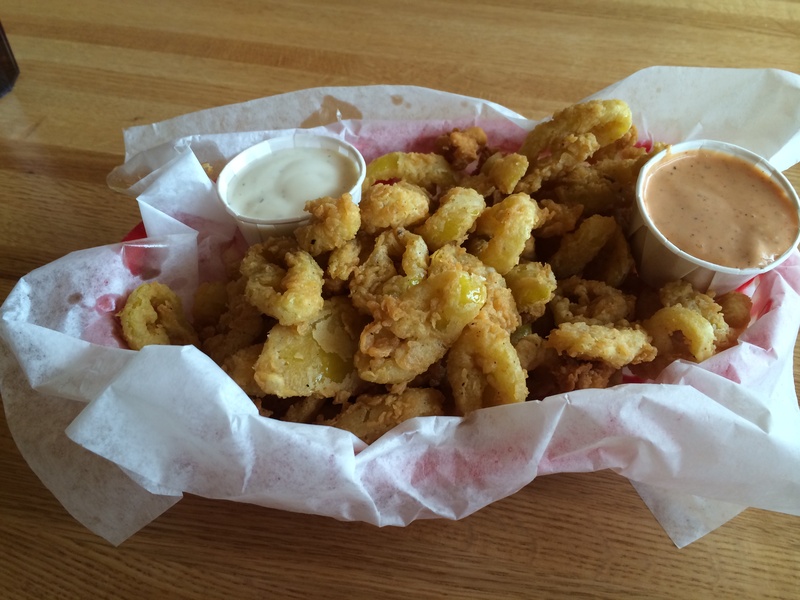 They have a selection of appetizers but we saw one we had not seen on any other menus around town – fried banana peppers. Oh, were they good! They give you ranch and another special dipping sauce that were both complimentary to the peppers. If you’ve never had banana peppers, they are not spicy hot, they have a little bitty kick to them with a sweetness. This is the only place I have ever had these. I know I will be back for some more. 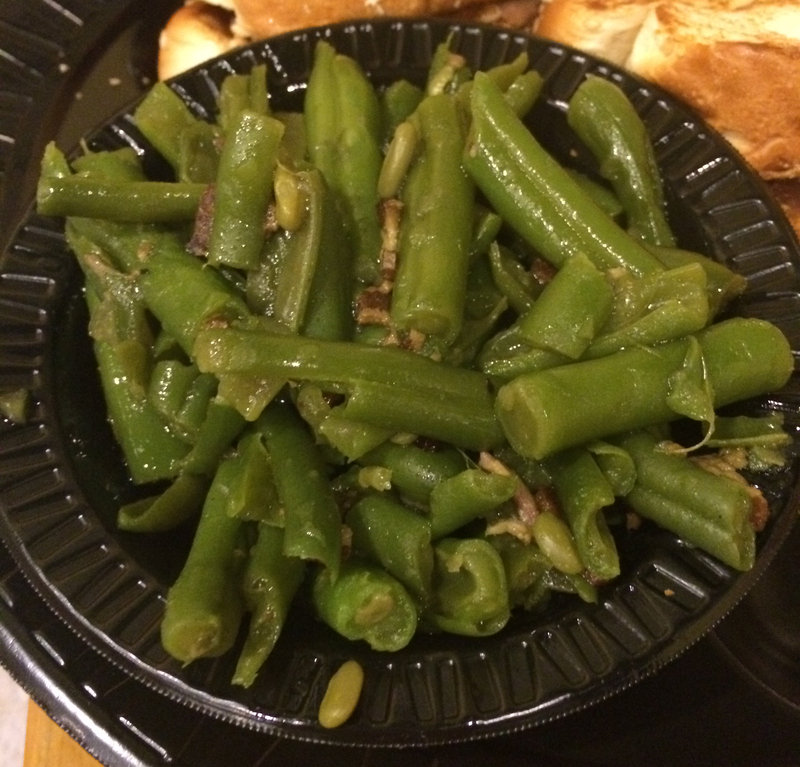 We enjoyed them and quick as we were popping them into our mouths, out came our main entrees. Ruth chose to combine two favorites, by getting the crawfish poboy. 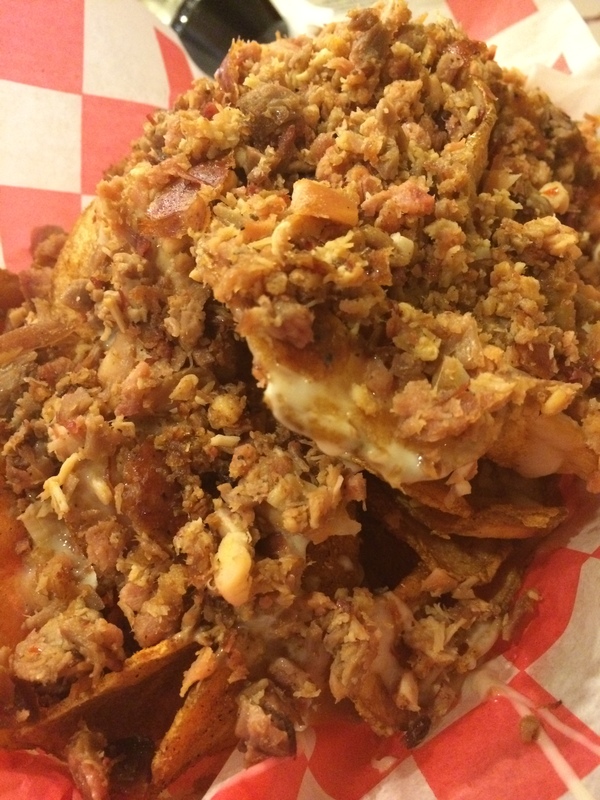 The crawfish are fried, and there was a mound of them. Alone they were enough for 2 meals! I told her to try the special sauce that comes with it and just eat some plain as she couldn’t close the poboy to eat like a sandwich. She loved them with just a little dipping and still had more than enough left to carry home for another meal tonight. The French bread of the po-boys comes from Gambino’s bakery out of South Louisiana. 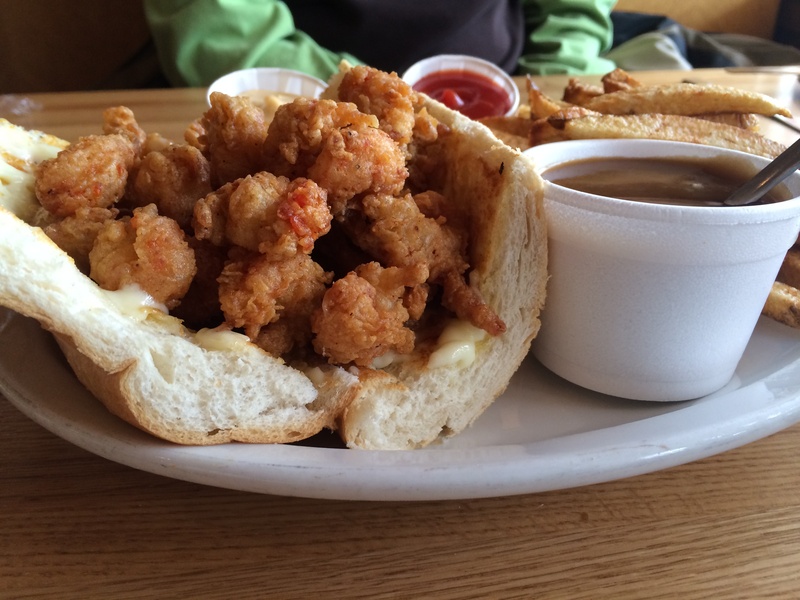 It is perfect for a po-boy or as the bread with your meal, which is what I had. 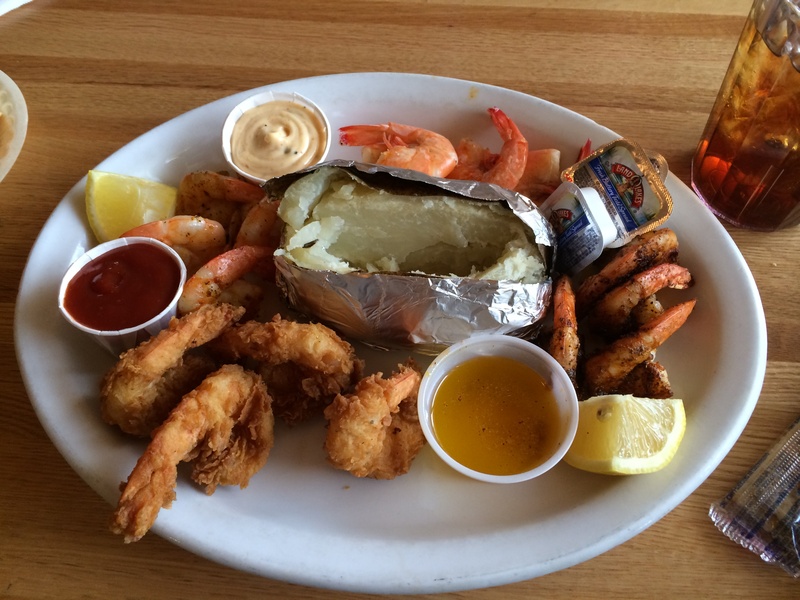 I enjoyed the shrimp sampler, to try the shrimp four different ways – fried, boiled, grilled, and blackened. I gave Ruth one of each to try, too. This may be why she carried home over half a po-boy! Ruth’s favorite was the blackened with the kick of spices that it had to it. My favorite was the grilled as they were flavorful and not overcooked. My meal came with a salad and a choice of potato – baked, fried, or fried sweet potatoes. We were stuffed, but know that their desserts are famous, especially the pies. It’s the meringue! I don’t know if I ever have seen meringue piled so high. 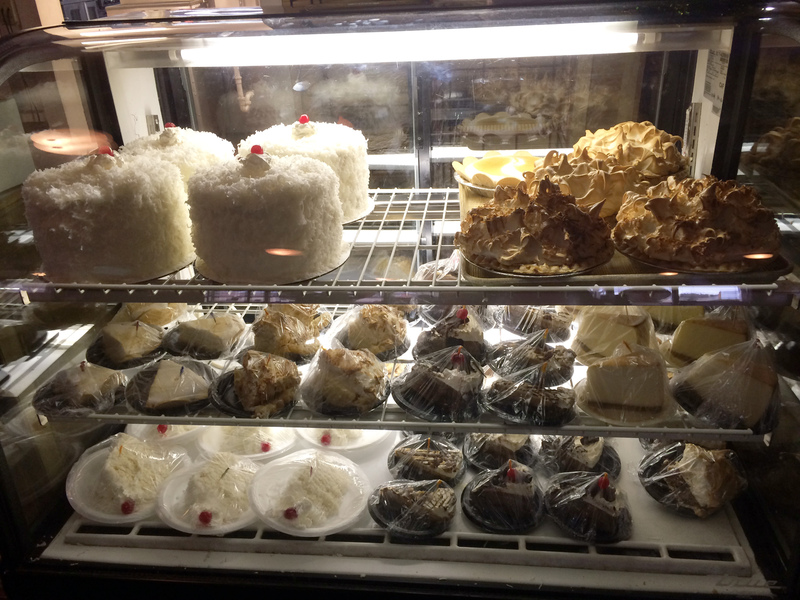 We went through the list of options – lemon, lemon ice box, chocolate mousse, pecan, and coconut. They also have a homemade coconut cake by Mrs. Terry that is about 5 layers high. I’d say it’s almost 12 inches high! If you like coconut (unfortunately, we don’t), it’s a must try. I have testimony from my coconut nutty friends that it is unbelievable. 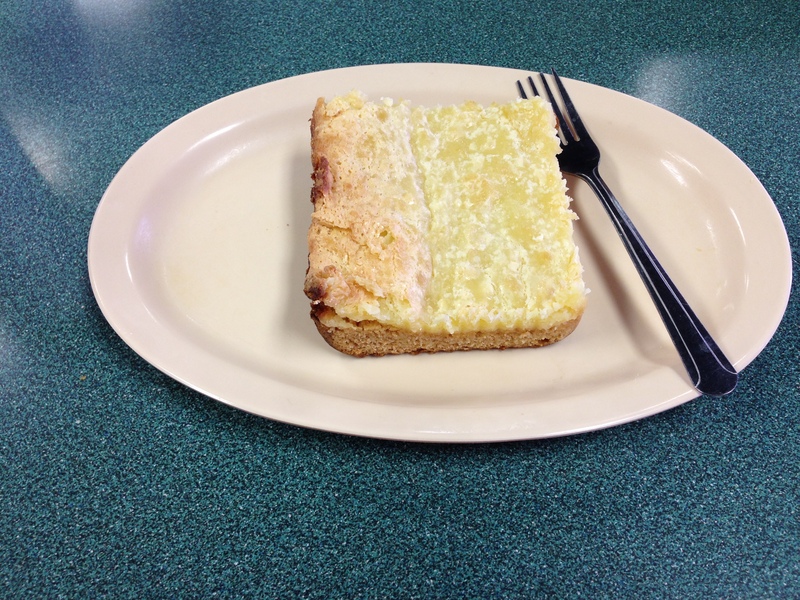 We chose lemon ice box, since it’s a true Southern dish. It was fresh and tangy lemon throughout. The crust was like a vanilla wafer cookie that we loved. 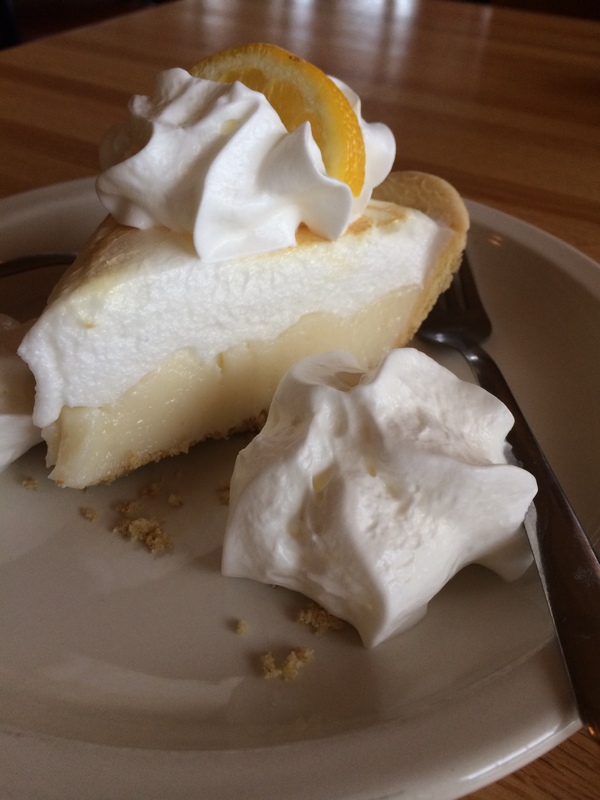 This type of pie does not require meringue, but the amount was just right for our over the top finish to lunch. If you have kids, they have to get a whoopie pie. It’s not a pie, but two homemade chocolate M & M cookies with icing in between. 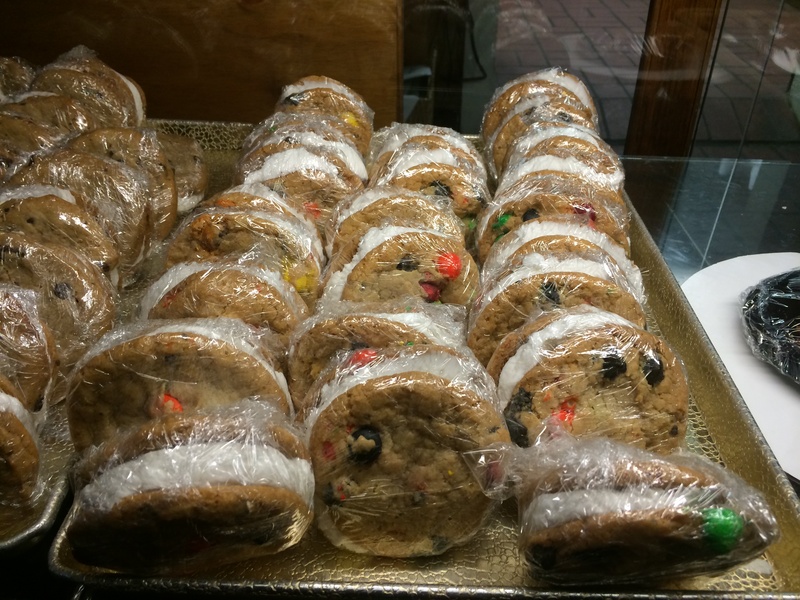 You might want to send them home with grandparents after the sugar rush, but they will love it too. I know mine do, as Mr. Robin and Mrs. Terry always make sure they get one somehow! 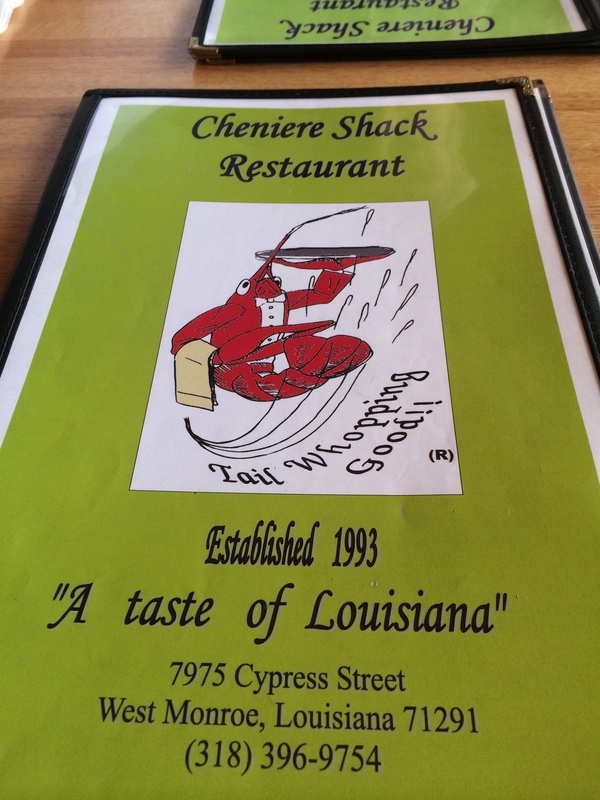 Cheniere Shack is the off the beaten path neighborhood restaurant, where most the folks eating there know each other by name. 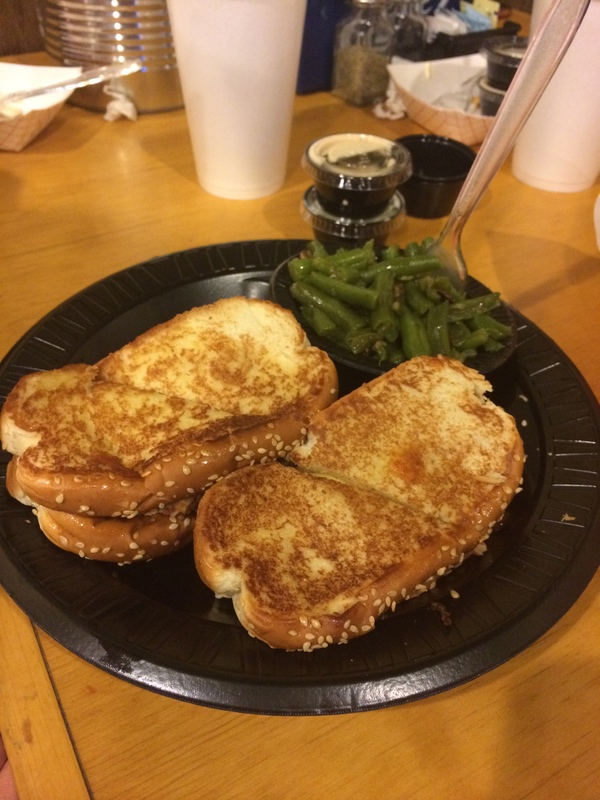 You’ll enjoy a casual dining experience with large portions for a reasonable price. During crawfish boiling season, you better arrive early, as they go through crawfish as quick as the season comes and goes. You might even find you make a new friend with some of the locals before you leave! Cheniere Shack is located in West Monroe at 7975 Cypress Street. They are open Monday-Thursday from 11 am to 9 pm and Friday-Saturday from 11 am to 10 pm. They are closed on Sunday.